Take Current Affairs quiz March 19, 2019 to enhance your General Awareness. Practice with our esteemed Current Affairs quiz March 19, 2019 questions which covers all important events across India as well as World. Make use of all important Current Affairs quiz March 19, 2019 questions with answers updated here, at free of cost to succeed in all competitive Exams and Interviews. According to the Economist Intelligence Unit's (EIU) Worldwide Cost of Living Survey, which of the following has been named world's most expensive city? According to the Economist Intelligence Unit's (EIU) Worldwide Cost of Living Survey, Asia's Lion City - Singapore has been joined by Paris and Hong Kong in a tie at the top of the table. Who won the Windham-Campbell Prize $165,000 under the non-fiction category? Indian Writer Raghu Karnad has won the Windham-Campbell Prize $165,000. Windham-Campbell Prize in the non-fiction category for his debut book, The Farthest Field: An Indian Story Of The Second World War. Which of the resolutions piloted by India did UNAE adopt? The United Nations Environment Assembly (UNEA) has adopted two resolutions piloted by India on single-use plastics and sustainable nitrogen management. What is the position of India in the overall medals tally at Asian Youth Championships 2019? Indian youth team finish second in the overall medals tally with a total of 26 medals including eight gold, nine silver and nine bronze medals. Which of the following becomes the first Indian Coast Guard ship to visit Indonesia? Indian Coast Guard Ship 'Vijit' became the first-ever Coast Guard ship to visit Sabang, Indonesia. ICGS Vijit is the 2nd in the series of 90 meter Offshore Patrol Vessels and was commissioned at Goa on 11 Dec 2010. 'Vijit' meaning ‘Winner or Victorious’. How many member states are there in Shanghai Cooperation Organisation (SCO)? The Shanghai Cooperation Organisation (SCO) is an international alliance that consists of 8 member states. __________ will be the first joint military exercise of Shanghai Cooperation Organization. The decision to hold Sary-Arka-Antiterror 2019, the first joint military exercise of Shanghai Cooperation Organization (SCO) was announced at the during the 34th meeting of the RATS council held in Tashkent, Uzbekistan. Recently which cyclone affected over 1.5 million people in Mozambique, Malawi, Zimbabwe? The cyclone, called Idai, has affected more than 1.5 million people in the three southern African countries - Mozambique, Malawi, Zimbabwe, according to the United Nations and government officials. ArcelorMittal got approval from _______ to buy Essar Steel worth Rs.42,000 crore? The National Company Law Appellate Tribunal (NCLT) gave a conditional nod to a Rs.42,000-crore offer by world’s largest steelmaker ArcelorMittal to buy Essar Steel. Business line Changemaker Awards were constituted in the year 2018 to mark the completion of 25 years by the Hindu Business Line. Assam state gets digital awareness, launches i-help initiative to promote electoral literacy. Which of the following won the Businessline Changemaker Award 2019 for the Category Changemaker of the Year? Businessline Changemaker Awards were constituted in the year 2018 to mark the completion of 25 years by the Hindu Business Line. Changemaker Of The Year was awarded to GST Council. Which of the following Indian shuttler won Silver medal at Swiss Open 2019? Indian shuttler Sai Praneeth won the silver medal at the Swiss Open after losing the men's singles final to world number two and top-seeded Chinese shuttler Shi Yuqi in Basel, Switzerland. Which company Launched Project Sangam To Boost Indias Swachh Bharat Mission? Microsoft Launched Project Sangam To Boost Indias Swachh Bharat Mission. Who Won Australian F1 Grand Prix 2019? Valtteri Bottas Won Australian F1 Grand Prix 2019.
Who topped the Forbes’ List of ‘World’s Richest Sports Team Owners 2019’? The chairman and managing director of Reliance Industries Limited (RIL), Mukesh Ambani topped Forbes' list of The World's Richest Sports Team Owners 2019, with a net worth of around $50 billion. Which country signed an MOU On Digital Education Initiatives with Afghanistan? India signed an MOU On Digital Education Initiatives with Afghanistan. How many countries jointly initiated the International Space Station (ISS) programme? The International Space Station is a habitable artificial satellite in low Earth orbit. The ISS programme is a joint project between five participating space agencies: NASA (United States), Roscosmos (Russia), JAXA (Japan), ESA (Europe), and CSA (Canada). Which of the following Russian aircraft successfully reached International Space Station? Russian Soyuz spacecraft carrying NASA Astronaut Nick Hague and Christina Koch, and Cosmonaut Alexey Ovchinin successfully docked International Space Station (ISS). Who was sworn-in as new Chief Minister of Goa? Pramod Sawant (45), former Speaker of Goa legislative Assembly and MLA from Sankhelim in North Goa was sworn-in as 13th Chief Minister of Goa, succeeding Manohar Parrikar, who died on March 17 after a prolonged battle with advanced pancreatic cancer. How many medals India won at Special Olympics World Games? India won 188 medals at Special Olympics World Games. Are you looking for right place to enhance your Knowledge on Current Affairs of 19th March 2019 through effective Quiz section? 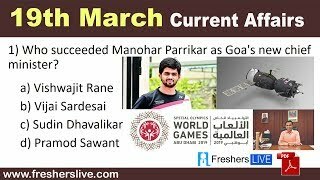 FreshersLive grants you the advantageous Current Affairs Quiz questions with accurate answers for 19th March 2019 which covers all the important events, supreme Awards, major occurrences in the National as well as World level. All important Current Affairs Quiz questions of 19th March 2019 are updated instantly in this page. Everyday at least 25+ Current Affairs Quiz Questions are displayed in this FreshersLive page. Correct Answer for each quiz question is given at the end of the entire 19th March 2019 Current Affairs Quiz questions section. You can estimate and upgrade your GK by attending these useful quiz questions. Entire quiz questions of 19th March 2019 Current Affairs covers Competitive Exam as well as Interview point of essentially important topics like International News, National News (ie. Indian Affairs), Science & Technology News, Environmental News, Bills & Acts Passed by Government, Defence News, About important Persons, Places, Banking & Economical News, Awards & Honours, Sports News, Revolutionary Updates on Arts & Culture, Obituary, Summits & Conference, Important Committee, Schemes, Appointments, Important Days & its Theme for Current as well as upcoming Year, Books & Its Authors, Agreements & MoUs, Budget, Taxes, Various Important Lists & Indexes, Visits by World Presidents, Prime Ministers, Political affairs and all Current Events. 19th March 2019 Current Affairs Quiz Questions updated in this page are prepared in the sense to help all aspirants to succeed in various Competitive Exams like UPSC IAS and other Civil Services Examination, Various Bank exams like IBPS PO, IBPS Clerk, SBI PO, SBI Clerk, RRB PO, RRB Assistant, Insurance exams like LIC AAO, UIIC Assistant, Railway Exams, Various Central Government Exams like SSC CGL, SSC CHSL, and more. Attempt all the Current Affairs Quiz Questions of 19th March 2019 and evaluate your score by matching your response with the correct answers mentioned at the end of this quiz questions section. By practising the FreshersLive Current Affairs Quiz Questions on a daily basis, you can surely succeed in the competitive exams as well as the interviews easily. Make use of this ultimate resource to the fullest and quickly achieve your goal!